This year we had an annual Food Bank event on November 23rd - 24th. 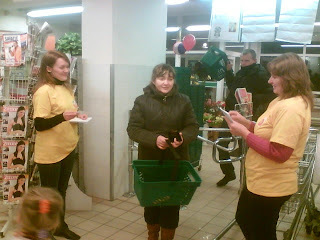 We were given a supermarket where our volunteers had leaflets to give out to the shoppers & invite them to buy food & donate it to us. We managed to collect food worth some 2300 Lt (approx. 670 Euro). The food is going to be given out to the seniors. Unfortunately, though we have our national economy growing rapidly for a successive year, but the gains of it are not shared equally by all. Those dependent on social system, especially the elderly, don’t see their income rise to at least keep pace with soaring prices for food & utilities (gas, electricity). Because of this it is important for them to get some material support & the food collected comes in very useful. Jest chemu pouchitsa, tak derzat! Brat Reno. January 29, 2008 at 11:11 p.m.